If you need ample rear-seat space, Toyota promotes the Avalon's "tunnel-less flat-floor design," which translates to rear-seat roominess. And if your financial future is a high priority, the 2008 Toyota Avalon gives you Lexus-quality materials at a price (and resale value) that say Toyota all the way. The Avalon no longer offers a front bench-seat option, so if you need seating capacity above five, it's not found here. Also, younger shoppers might shun the Avalon because of its older-owner image. The Avalon receives a slight exterior freshening and a new six-speed automatic transmission. XL trims offer the option of a four-way power passenger seat, while XLS and Limited models offer an eight-way power passenger seat. Spacious and handsome, the 2008 Toyota Avalon looks inviting and feels comfortable. Extra width gives occupants another inch of shoulder space. Instruments are large and symmetrical, though smaller readouts are harder to see. Lustrous woodgrain on high-end models helps make the dashboard attractive and distinctive. The glovebox is large, but sits low. A pushbutton starter is included with the Limited trim; you don't even have to hold the button in, just push and release. To entice younger buyers, the Touring model has a unique interior with a sportier charcoal dashboard trim. As promised, this four-door sedan looks different enough from the Camry to attract a separate set of customers. Details count. Wide-opening doors have three-stage door checks to ease entry and exit. The back doors open wide -- to almost 90 degrees. Jointless flat windshield-wiper blades are half the usual thickness and are said to ensure even pressure and reduce wind turbulence. Limited sedans have rain-sensing wipers and an acoustically-dampening windshield. Each trim level has its own wheel design: 16-inch for the XL and 17-inch for other models. The 2008 Toyota Avalon has a personality even more distinct from the Camry, along with Lexus-like attributes. On good roads, the ride is generally smooth. Still, the relatively taut suspension delivers noticeable harshness when encountering certain bumps and holes. Acceleration is sufficiently assertive, but the Avalon feels like a heavy automobile. Though not up to European sport-sedan levels, the Avalon has responsive steering and handles with reasonable agility. An abundant glass area helps with overall visibility. Side bolstering is modest, but the seats are supportive and nicely cushioned. Rear headroom is so-so, but leg space is abundant and the reclining seats are helpful. The Avalon XL's Manufacturer's Suggested Retail Price (MSRP) starts just under $28,000, while the Touring is around $30,000, the XLS around $32,000 and the Limited just over $35,000. The Avalon's popularity may make dealing somewhat difficult, as evidenced by the figures shown on the Fair Purchase Price page. Typical transaction prices for the Avalon sit just a few hundred dollars below MSRP. Before you set off to purchase, check out the most recent Fair Purchase Prices for any change in the Avalon's sales pattern. Over time, the Avalon is expected to retain exemplary residual and resale values, far better than the Buick Lucerne, Ford Taurus and the Chrysler 300 Touring. All Avalons use a six-speed automatic transmission. Anti-lock disc brakes (ABS) incorporate Electronic Brake-force Distribution (EBD). Steering wheel-mounted audio controls and dual-zone climate control are standard. Seat comfort is enhanced by reclining rear seatbacks and adjustable-length front cushions. Perforated leather upholstery and a moonroof are included in the Limited. The Touring model has leather-surfaced bucket seats and high-intensity discharge headlamps. All models include front seat side-impact airbags, front and rear side-curtain airbags, driver's-side knee air bag, a six-disc CD changer and an auxiliary audio input jack. Vehicle Stability Control (VSC) is available for all trim levels. Touring, XLS and Limited models offer a GPS navigation system with voice recognition that responds to 200 commands. Dynamic Laser Cruise Control, which lets you set the preferred distance you wish to maintain from the vehicle ahead, is optional on the Limited. Three radios are available, including a JBL Synthesis 360-watt system with 12 speakers, and the dealer-installed remote engine starter works from up to 80 feet away. Seat-mounted airbags, side-curtain airbags and a knee airbag for the driver are standard on all models. Vehicle Stability Control is an option. Standard on all Avalons, the five-position rear-seat recliners adjust from a 25 to 35-degree seatback angle. The Avalon's V6 qualifies as one of the best in the business. It's so silent at idle that glancing at the hovering tachometer needle might be the only way to be sure the engine is actually running. Power for passing and merging is excellent, as are the seamless shifts offered up by the new six-speed automatic transmission. Despite its ample size and quick acceleration, the Avalon offers fuel economy figures comparable to some four-cylinder economy cars. The 2008 Avalon is Toyota's flagship sedan. One step above the popular Camry, the full-size Avalon offers a generous interior packed with so much luxury many owners consider the car to be almost Lexus-like. In what has long been the domain of the domestic automakers, the Avalon offers full-size car buyers a modern, front-wheel-drive sedan with an impeccable history of excellent service, outstanding quality and best-in-class resale. Beyond its solid engineering attributes, the Avalon also offers customers a powerful yet fuel-efficient V6 engine, a huge and easily accessible trunk and a sense of style not found in traditional full-sized sedans, such as the Ford Crown Victoria and Mercury Grand Marquis. Toyota lover. Love the performance, ride, dependability, and the brand. I have been an owner of a Toyota for over 14 years. I had my Camry for 12 years. I decided to upgrade to an Avalon and I love it. The performance is excellent. I can get to 60 mph in seconds and out of the way of traffic. The ride is very comfortable and quiet. It feels like a luxury ride with the heat and cool leather seats and cruise control. I love the light indicator that tells me my tires are low, which helps with gas mileage and performance/ride of the car to perform at its optimal level. I like the slickline of the car and the sunroof. It is a nice ride. As a driver and owner, I appreciate the reliability and economy of owning this car. What I like: reliability, fuel economy, ease of repairs, luxury accommodations, size for my family, ergonomics of interior and design of functions like controls, navigation, stereo, etc. What I dislike: I miss features that were included in my suburban that are not available for this car: 4WD, towing capacity, cargo space for trips or projects involving large transport (diy, furniture rehab, etc). I live in an area that is often snowy or icy in the winter and may consider purchasing another truck to replace or supplement the Toyota. The 2008 Toyota is a very comfortable, smooth, and fun vehicle to drive. 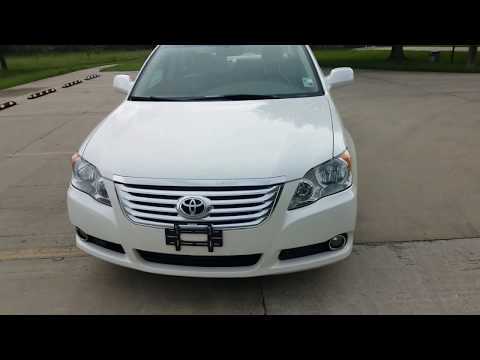 The 2008 Toyota Avalon is very dependable. It provides a nice quiet and smooth ride. It is equipped with a v-6 engine that provides power when needed. For comfort it has hot and cold controls for both front seats. Dual controls for heat and air conditioning. It is also equipped with an a stereo with a multi disc mp3 player. It also has power windows and power locks as well as a sunroof. It is a very comfortable and fun car to drive.